We have been watching the development of the Rukbug pushchair for some time now, but were rather surprised when they asked to send us a footmuff to review. 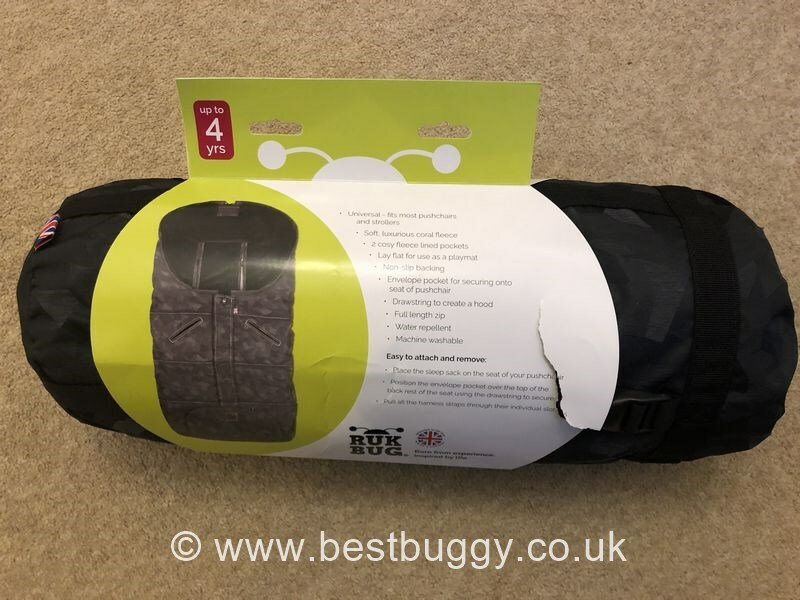 We love Rukbug and the way they work, so we agreed to have a look at an early sample of their new Sleep sack, because we suspected that any product coming from them, would have a superb and innovative design. Wow! We are so glad we agreed because the Rukbug Sleep sack is one of the best footmuffs we have ever seen here at BBHQ. The Rukbug Sleep sack seems to have thought of everything. It is the right combination of comfort with practicality. 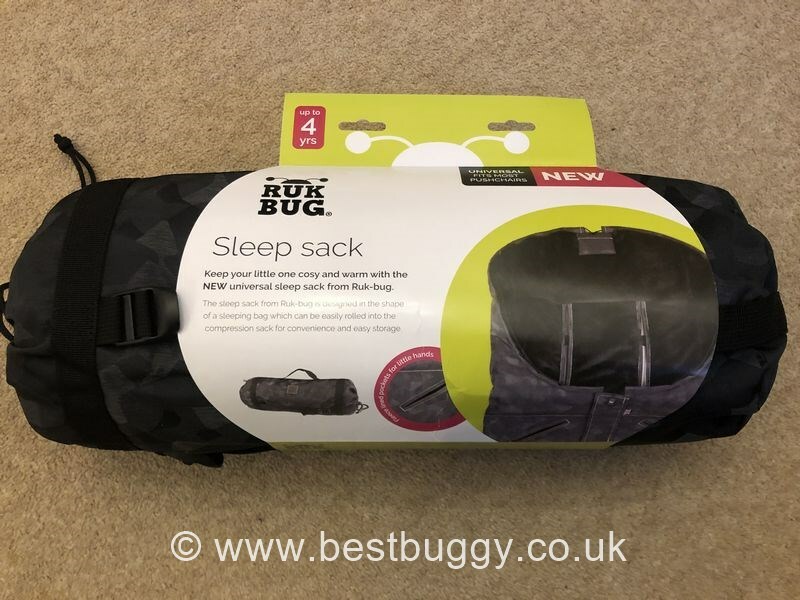 The Sleep sack arrives rolled up in a drawstring bag, which is great for storing your Sleep sack in when not required, but could also be used for storing other items in e.g. wet clothes or nappies. When rolled up, the Sleep sack fits easily and neatly under any pushchair, or will hang off a handlebar. However, thats not really not how a footmuff should be used! So we unrolled it and relished the experience! As we unrolled the Sleep sack it was clear the fabrics are fantastic quality. This first Sleep sack has camouflage fabric, which won’t be to everyone’s taste, but more fabrics will introduced to the range. The fabrics themselves are waterproof which has kept our little ones lovely and dry even when they have refused to have a raincover over their pushchairs. What we love are the details: the lovely Rukbug logo on aged leather, which gives the Sleep sack a quality feel. We love the sporty zip tags with Rukbug log on the zips in the centre and the bottom. Opening the zip revealed the most softest, snuggliest furry fabric ever. When Miss BB saw the Sleep sack she immediately said she wanted to climb in! Of course she is too big, but it is really the most tactile fabric ever and she didn’t want to put it down! We have tested the Rukbug Sleep sack out with a range of children from 9 months old to a large 3 year old, and all fit well. The children who have been fortunate enough to test the Sleep sack out have all absolutely loved it. One 3 year old called it their ‘Snuggle Snoozer’ and insists on sleeping in it every day. The children absolutely love to snuggle into the furry liner and to sleep in it, and a comment from a childminder tester is that its helping with naps because the children climb in, snuggle down and then sleep for ages! During the colder days, the older children have been pulling the hood over their heads, pulling the drawstrings until they couldn’t be seen, and snuggling right in. One fantastic detail that Rukbug have added are furry pockets! Absolute genius! Master BB would never wear gloves and would always get cold hands. But the Sleep sack has fur lined pockets which are beautifully finished with a leather trim. One tester in particular had a child who also refused to wear gloves, but he happily tucked his hands into the pockets to keep them toasty and warm. Last week we had a warm spell, but the children refused to let the Sleep sack be removed from their pushchairs because it is so comfy and snuggly as a liner. The Rukbug Sleep sack has been fitted onto a variety of single and double pushchairs and buggies, and has fitted them all thanks to the universal harness slits with their touchtape fastenings. There are other little details to note such as the zip opening at the bottom of the Sleep sack which allows muddy feet to hang out until you get home, thus keeping the furry interior nice and clean. We like how there is a flap both over these zips, and also the main zips to prevent draughts getting in. We love the dinky pocket into which the pull cords fit to keep them tucked out of the way. We like that there is an centre seat opening for pushchairs to faciliate a seat pull closure such as on a Baby Jogger or a Britax pushchair. We love how the footmuff rolls neatly up, and can be held together using the touch tape fastenings. The only negative comment has been that despite having anti-slip lining, the Sleep sack does slide down a fair bit. Rukbug were particularly looking for development feedback from us, so we have suggested that ties are added to prevent slipping. The feedback all round has been that the children LOVE IT, and our childminder tester has asked if she can buy one because all her children love it! We have to agree that we have never seen such a beautifully designed footmuff. It is clear that whoever designed this, knows what children need from a footmuff and have thought about the details. The adults would like a matching furry handmuff next please.